← Tagine of Lamb with Chickpeas and Butternut Squash; too many butternut! Warning: Strong opinion to follow – read at your own risk. What is the word (or almost word) that makes you want to jump up and down, screaming and tearing your hair, whenever you hear it? Most people who like words have one (or more) that rankle. Hearing the word used incorrectly or inappropriately is like fingernails on a blackboard…. For those who actually remember blackboards…. For mon mari it's an 'almost word' – not really a word, but one hears it so often, most people think it is. Regardless says it very nicely, no need to add the prefix. Mine is, perhaps, one of the most common, basic words… and it sends me up the wall on a regular basis. A home is a place where one lives. A home can be, but does not have to be, in a house. A home can be in an apartment, a trailer, a tent, a boat or a cardboard box. A home can be in what is owned, rented or borrowed. One cannot buy a home or sell a home. A home is where we are. A house, on the other hand, is a building. A house can be, but does not have to be, a home. A house can be an office, a tattoo parlor, a meth lab or a place of worship. A house can be abandoned, demolished, torn down or derelict. One can, and does, buy and sell a house. Home = where one's heart is. House = bricks and mortar; wood and plaster. I also abhor the widespread use of unnecessary syllables. One no longer buys a car, one buys a vehicle (well, it's always been a vehicle, just of the subset 'car'). On television 'the 'perp' aims a weapon at the 'vic''. The writer shortened two perfectly good words and substituted a longer one. What was wrong with 'the guy aimed a gun at him'? Two people no longer 'talk', or even 'have a discussion'. Now they have a 'dialogue'. Do they accomplish more by having a dialogue than by talking? One last, brief, rant…. The British habit of using plural verbs with singular nouns. Yes, a team is composed of more than one person. But the team, itself, is a single entity. My Oxford and Cambridge educated British friend agrees with me. 'England is losing' is correct. He also assured me that the usage was far too ingrained to ever change. What words drive you bonkers? In honor of Chinese Neew Year we're having an 'almost authentic' soup. 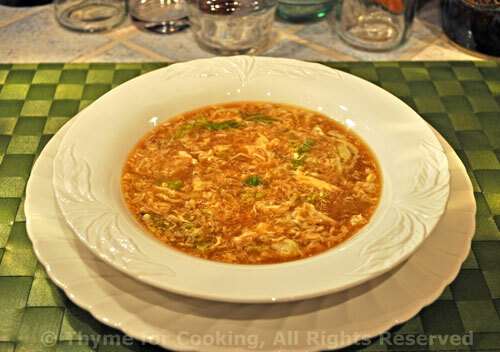 This is a little twist on traditional Hot and Sour Soup – with the addition of slivered cabbage for a bit of texture and crunch. Thinly slice cabbage and green onions. Heat oil in a medium saucepan. Add onions, cabbage and stir-fry for 5 minutes. Add chicken stock and heat to boiling. Crack egg into a bowl and whisk lightly. Stir dissolved cornstarch into the boiling stock, until thickened. Add soy sauce and vinegar. Pour in egg, stir once or twice only. Ladle into 2 bowls and serve immediately. 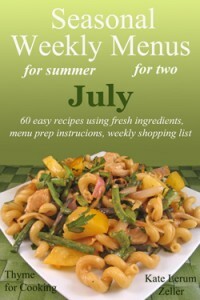 In addition to this, for the week of February 4 we have Stir-Fried Scallops with Ham, Noodles with Egg Sauce, Sweet and Pungent Carrots, Braised Beef Provencal, Turkey and Cashew Lo Mein…. It’s (it is) for its (possessive). Zoomie, along those lines are borrow and loan – can you borrow me some money? bpf125, have you read ‘Eats, Shoots and Leaves’ LOL I blame spell check for some of that, at least for me – I know the usage, but can’t type…. babs, and (as heard on the gold course) How did you play? Good. I am more irritated by poor spelling – one sees errors left, right and centre these days and poorly written grammar on public notices or ads also urks me ! “Here ya go,” rather than “Here you are.” The first sounds dismissive and cavalier. The other is “No problem,” rather than “You’re welcome.” I’d like to think that doing something that would garner the acknowledgment of a “Thank you,” doesn’t put one out too much. Lovely soup. I haven’t had hot and soup in ages. Great soup! It sounds and looks delicious! Here apparently, people don’t have a dialogue; they dialogue. And there is my pet peeve. Nouns that have been turned into verbs. Apparently, there’s a term for it: “verbing”. Eeeeeeek!! Another loathsome and inaccurate phrase is “I could care less”. Really. One has to wonder how much less. One does not “grow” a business, as it is not actually a living, organic thing. One *builds* a business. That one drives me crazy as a small business owner. The rampant misuse of apostrophes. As a button I own proclaims (badly paraphrased): Society for the protection of punctuation — an apostrophe does NOT mean ‘beware oncoming s’. 🙂 It particularly irritates me to see it in “professional” ads and business correspondence. That nasty habit of making verbs into nouns bothers me badly as well. Can’t think of any examples, but they make me grit my teeth when I read them. manningroad, bad spelling and grammar on signs drives me up a wall! Pam, trite phrases, repeated often…. I agree. Laurie, sadly, I think language (one’s own) and grammar are no longer taught… and spellcheck can only do so much!